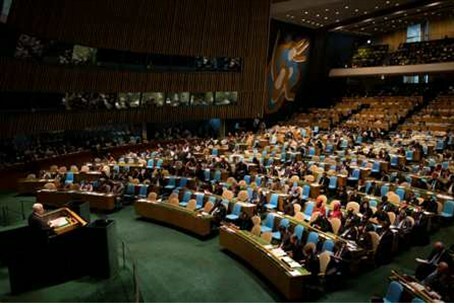 A private memo secured by the London Guardian, advises that recognition by the General Assembly "would be extremely counterproductive," and it openly hinted that such a move could result in financial sanctions. PA Chairman Mahmoud Abbas has a guaranteed majority in the General Assembly, but American pressure and possible financial repercussions could sway a number of pro-Arab countries to abstain or even vote against upgrading the Palestinian Authority’s current non-member status. The timing of the leaked memo could not be better for President Barack Obama, who has been accused by Republican presidential nominee Mitt Romney of "throwing Israel under the bus.” Rejection of Abbas’ could be the dearth knell for his regime, already troubled by deep financial troublers and charges of widespread corruption. However, the actual General Assembly vote, unless Abbas withdraws the bid, probably will take place three weeks after the presidential elections in early November. Presumably, President Obama could change his stand after the vote, regardless of the outcome. The Guardian said the State Dept. has declined to comment on the memorandum, which stated that recognition of the Palestinian Authority as an independent entity “can only be achieved via direct negotiations with the Israelis." The memorandum urged both Israel and the Palestinian Authority "to avoid provocative one-sided actions that could undermine trust or otherwise distract from the pursuit of peace,” the British newspaper added. "We believe your government understands what is at stake here, and – like us – wants to avoid a collision at the coming UNGA session," stated the message, which was delivered at the UNGA meeting last week stated. “We hope you are willing to support our efforts … We would appreciate knowing where your government stands on this issue,” the memo continued. “We would also be interested in knowing whether you have been approached on this matter by Palestinian representatives." The Netanyahu government has silently shelved a report by three legal experts that concluded there is no such "occupation” and that international law actually protects Jewish rights to live in all of Jerusalem, Judea and Samaria. Palestinian Authority officials harshly criticized the United States for the reported memorandum, which Palestine Liberation Organization (PLO) executive committee member Hanan Ashwari charged was "typical American behavior but also overkill". "It is ridiculous and unconscionable the way they put themselves at the service of Israel in such a blatant way. This is tremendous American pressure and bias," she was quoted by the Guardian as saying.